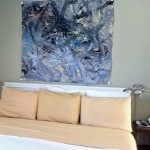 Room 6, patio view, Queen Bed, pet friendly…check out the cool original Art! Ours is a 16 room retro Motel. 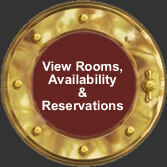 Simply CLICK ON OUR Reservation Medallion (to the right) to make your reservation and to view each room. No smoking environment on or near our premises. Maximum occupancy 2 persons inclusive of children 3 years and older. 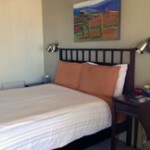 The rooms are small, extremely clean, comfortable, and in the best location on the Waterfront. Most rooms are 11.5X11.5 feet. 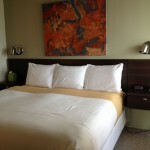 We have a few deluxe rooms that are larger than the Standard room size. 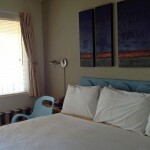 Our rooms offer individualized decor and original art work. We use 100% high count cotton fitted sheets and encase the bedding with a crisp white sheet. Organic products are used for Bath amenities. The rugs are washed after every guest. Ceramic cups and glasses are in the room. Make your in-room coffee using the Keurig or enjoy our daily brewed coffee in our Galley . This is a walk-up property without an elevator. 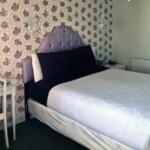 Standard rooms offer one bed; one Queen bed or one King bed. Room size is approximately 11.5X11.5 sf (not including the shower only bathroom). Occupancy limit: 2 Adult persons plus 1 child under 3 years old. Room size is approximately 11.5X11.5 (not including the shower only bathroom). 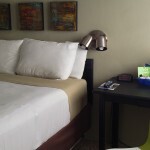 11, 12, 15, and 16 are pet friendly rooms with additional cleaning fee. (See pet policy.). Room no. 9 offers 1 King Bed, a seating area, and desk. 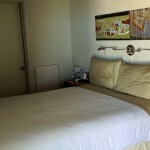 It is an end room on the courtyard level and is pet friendly with an additional animal cleaning fee. (See pet policy). Room 10 offers 1 King Bed. It is an end room on the 2nd floor with view of bay and Morro Rock. Not pet friendly. It offers a nice seating area and desk. Room #20 offers 1 king bed and a view window that overlooks the bay. It is not a pet friendly room. Room #18 is tucked away in the corner, no view, with a landing seating area. Smaller than a Standard Room. 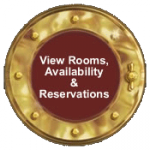 Check out other photos of our rooms on the drop down menu or click the Medallion to the right .